Ecublens, Switzerland: – Dec Group, will use the forthcoming ACHEMA 2015 expo in Frankfurt to showcase latest additions to its proprietary Powder Transfer and Drum Containment systems, PTS and DCS, as part of its on-going mission to help reduce risks in the pharmaceutical and fine chemical industries. The Dec stand, at Booth D8 in Hall 5.0 at Frankfurt Messe, will stage live demonstrations of the PTS Powder Transfer System flagship product, showing various ways in which it can provide cleaner and more contained links between different powder handling processes along with safe reactor loading. The Dec team at ACHEMA will also demonstrate a combination of the DosiValve dosing unit with Powderflex for contained continuous conveying and precise dosing of powder. 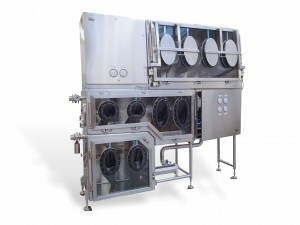 DosiValve is a recent addition to Dec’s line of products; a pneumatically driven piston dosing unit that eliminates the need for a buffer hopper or other intermediate receptacle between transfer and dosing processes. Dec will round out their display with the demonstration of the MC50 Jetmill particle size reduction equipment for micronizing powder down to 5 micron particle size. Last but not least, the show set up will feature the Isocharge solution for ergonomic and contained emptying of bags and/or drums to the highest standards of containment (less than 1 µg of escaped particulate per cubic metre). “ACHEMA is an important event for us as an exhibitor as part of our mission to promote global solutions for the pharmaceutical and chemical manufacturing industries,” said Gabriela Mikhaiel, the company spokesperson. “This is where we get excellent opportunities to talk with the expert pharmaceutical and chemical manufacturing process engineers and decision makers who appreciate the benefits of our technology and solutions,” she further added. Now in its 31st year, the 2015 ACHEMA event will be held over five days, opening June 15th 2015 at the Messe Exhibition Centre in Frankfurt-am-Main, Germany. Click on Dec showcasing latest containment technologies at ACHEMA 2015 for more information.